People walking outside the Louvre museum in Paris have destroyed a major French artwork, on March 30. A huge collage was installed in recognition of the 30th anniversary of the I.M. Pei-designed glass pyramid at the Louvre, on the evening of March 29. 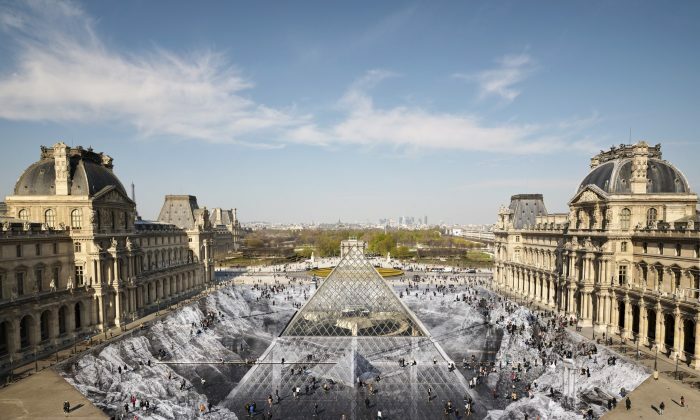 French street artist JR had used 2,000 pieces of paper to create what appeared to be the Louvre’s steel-and-glass structure emerging from a rock quarry. Some 400 volunteers took four days to put together the Secret of the Great Pyramid, which was touted as JR’s largest work ever and spanned an impressive 18,000 square feet. The project was dedicated to the late and influential filmmaker, Agnès Varda, who died just a week earlier. However, the morning after, the work was severely damaged. Some visitors could be seen walking over the collage, causing the paper to become unstuck from the surface of the glass pyramid and disintegrate. People taking photos for social media could be seen carelessly ripping pieces off the artwork and taking them home as souvenirs. JR posted a photo to Twitter of what the Secret of the Great Pyramid looked like before being opened to the public. From the perspective he used, from the third floor of the museum, the pyramid appeared to be twice the original height. In the tweet, he explained his thoughts about the collage. “This project is also about presence and absence, about reality and memories, about impermanence,” he added. Later that same day JR expressed his shock that it was destroyed well before the collage was due to be taken down on April 1. JR is no stranger to covering the Louvre with art, having in the year 2016 posted a photo across the entire landmark using anamorphosis, a technique used to distort perspective by creating an optical illusion that the Louvre had magically disappeared. A spokesperson for the Louvre said the artist already knew the collage would eventually be damaged. “We did not know how quickly it would happen,” the spokesperson told the Huffington Post.